Figure 1. In the absence of insulin or growth factors, FOXO transcription factors are located in the nucleus, where they specify target gene expression (see text for details). Knowing what kind of genes are involved in the main biological processes is much more relevant to your life than which car is faster, Porsche or Jaguar. And I’m not talking about dangerous driving here. I am talking about the crucial information about the genes that govern your longevity. You have to know what they are, what they do, what happens to them during aging and what are the ways to make them work better, towards keeping you young for a longer time. I am reprinting the text of the article written by Dr. Matthew Carter and Dr. Anne Brunet from Stanford University. I let myself explain some of the biological terms in brackets to make this beautifully written story of one gene a bit simpler. This is a must-read. What are they? FOXO proteins are a subgroup of the Forkhead family of transcription factors (proteins that can bind to DNA and “switch on” other genes) . This family is characterized by a conserved DNA-binding domain (the ‘Forkhead box’, or FOX) and comprises more than 100 members in humans, classified from FOXA to FOXR on the basis of sequence similarity. These proteins participate in very diverse functions: for example, FOXE3 is necessary for proper eye development, while FOXP2 plays a role in language acquisition. Members of class ‘O’ share the characteristic of being regulated by the insulin/PI3K/Akt signaling pathway (a chain of reactions within a cell that is the response to a signaling molecule attaching to a receptor on the surface of the cell). How did this family get named ‘Forkhead’? Forkhead, the founding member of the entire family (now classified as FOXA), was originally identified in Drosophila as a gene whose mutation resulted in ectopic (meaning unusual) head structures that looked like a fork. Forkhead proteins are also sometimes referred to as ‘winged helix’ proteins because X-ray crystallography revealed that the DNA-binding domain features a 3D structure with three α-helices flanked by two characteristic loops that resemble butterfly wings. How many FOXOs are there? In invertebrates, there is only one FOXO gene, termed daf-16 in the worm and dFOXO in the fly. In mammals, there are four FOXO genes, FOXO1, 3, 4, and 6. Hey, what about FOXO2 and FOXO5? FOXO2 is identical to FOXO3 (a.k.a. FOXO3a, as opposed to FOXO3b, a pseudogene, dysfunctional relative of a gene, unable to produce protein). FOXO5 is the fish ortholog (genetic analog) of FOXO3. FOX hunting… FOXO genes were first identified in humans because three family members (1, 3, and 4) were found at chromosomal translocations (errors) in rhabdomyosarcomas and acute myeloid leukemias. Just after FOXO factors were identified in human tumor cells, the crucial role of DAF-16 in organismal longevity was discovered in worms. DAF-16 activity was shown to be negatively regulated by the insulin/PI3K/Akt signaling pathway (the pathway that provides cellular response to insulin). Subsequent experiments in mammalian cells showed that mammalian FOXO proteins were directly phosphorylated (a phosphate was bound) and inhibited (suppressed) by Akt in response to insulin/ growth factor stimulation. Thus, FOXO factors are evolutionarily conserved mediators of insulin and growth factor signaling (meaning they are present in the majority of animals throughout the evolutionary tree from simple species like worms to humans). Why are they important? FOXO transcription factors are at the interface of crucial cellular processes, orchestrating programs of gene expression (production of proteins) that regulate apoptosis (cellular programmed death), cell-cycle progression, and oxidative- stress resistance (Figure 1). For example, FOXO factors can initiate apoptosis by activating transcription of FasL, the ligand for the Fas-dependent cell-death pathway, and by activating the pro-apoptotic Bcl-2 family member Bim. Alternatively, FOXO factors can promote cell-cycle arrest (it’s when the cell can’t continue its life path, stops dividing); for example, FOXO factors upregulate (increase production of dependent proteins) the cell-cycle inhibitor p27kip1 to induce G1 arrest (a point of time in the cell-cycle when the cell needs to check whether its DNA has no errors, and if it doesn’t, it can go on to the next stage of development) or GADD45 to induce G2 arrest (point of time when the cell checks if it has any DNA errors after replication, and if it doesn’t it can start mitosis). FOXO factors are also involved in stress resistance via upregulation of catalase and MnSOD, two enzymes involved in the detoxification of reactive oxygen species. Additionally, FOXO factors facilitate the repair of damaged DNA by upregulating genes, such as GADD45 and DDB1. 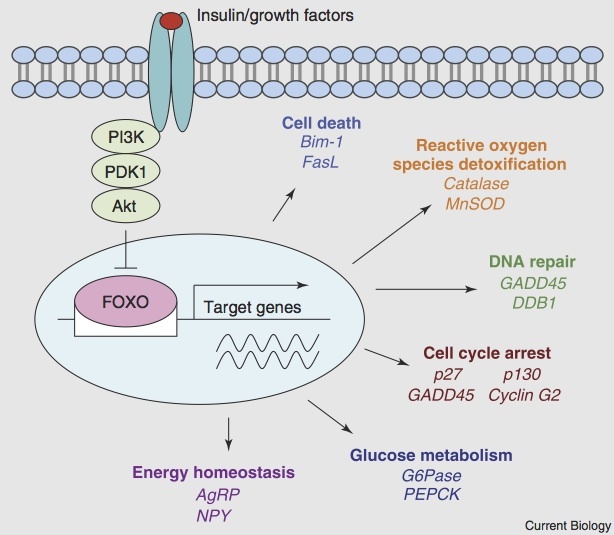 Other FOXO target genes have been shown to play a role in glucose metabolism, cellular differentiation, muscle atrophy, and even energy homeostasis. How are they regulated? FOXO proteins are tightly regulated to ensure that transcription (first step in protein synthesis) of specific target genes is responsive to environmental conditions. A major form of regulation is Akt-mediated phosphorylation of FOXO in response to insulin or growth factors (Figure 1). Phosphorylation at three conserved residues results in the export of FOXO factors from the nucleus to the cytoplasm, thereby inhibiting FOXO-dependent transcription. FOXO proteins are also phosphorylated by other protein kinases, including JNK or Mst1, which phosphorylate FOXO under conditions of oxidative stress. This phosphorylation causes the translocation of FOXO from the cytoplasm to the nucleus, thus opposing Akt’s action. In addition to being post-translationally modified by phosphorylation, FOXO proteins also bind to co-activator or co-repressor complexes and become acetylated or deacetylated (process of adding or removing the acetyl group). For example, the deacetylase SIRT1 increases FOXO DNA-binding ability by deacetylating FOXO in response to oxidative stress. FOXO proteins are also monoubiquitinated (added one ubiquitin group) under conditions of oxidative stress and this increases transcriptional activity. Finally, FOXO proteins can also be polyubiquitinated and targeted for protein degradation. The unique phosphorylation, acetylation, and ubiquitination status of FOXO under specific environmental conditions may provide specificity in the regulation of subsets of FOXO target genes. What is the role of FOXO in longevity? FOXO factors have been shown to prolong lifespan in invertebrates. The worm orthologue, DAF-16, activates a program of genes that extend longevity by promoting resistance to oxidative stress, pathogens, and damage to protein structure. Mutations in the insulin receptor or PI3K extend longevity up to threefold, and this extension is reverted when daf-16 is mutated. In flies, overexpression of dFOXO is sufficient to increase longevity. The role of FOXO factors in mammalian longevity is currently being explored. Mice that are deficient for either the insulin receptor or the insulin-like growth factor receptor-1 can live up to 30% longer than wild-type mice, suggesting that FOXO factors could be involved in mammalian longevity. Furthermore, FOXO target genes involved in stress resistance are conserved between invertebrates and mammals, suggesting that the function of FOXO in organismal stress resistance and longevity is evolutionarily conserved. Isn’t it strange that FOXO could induce both stress resistance and cell death? The regulation of stress-resistance genes and pro-apoptotic genes by FOXO is not necessarily a paradox. FOXO factors may orchestrate different patterns of gene expression based on the intensity of the stimulus, perhaps activating stress-resistance genes under mild conditions but pro-apoptotic genes when the intensity of stress stimuli increases beyond a certain threshold. It is also possible that FOXO factors regulate different genes in different cell types, causing apoptosis in some cells (e.g. neurons, lymphocytes) while promoting survival in others. Importantly, the induction of apoptosis by FOXO may cause the death of damaged or abnormal cells, therefore benefiting the longevity of the entire organism. Is there a connection between FOXO and cancer? Because FOXO proteins were originally identified in human tumors, and because they play an important role in cell-cycle arrest, DNA repair, and apoptosis — cell functions that go awry in cancer — the FOXO family is thought to coordinate the balance between longevity and tumor suppression. Consistent with this idea, in certain breast cancers, FOXO3 is sequestered in the cytoplasm and inactivated. 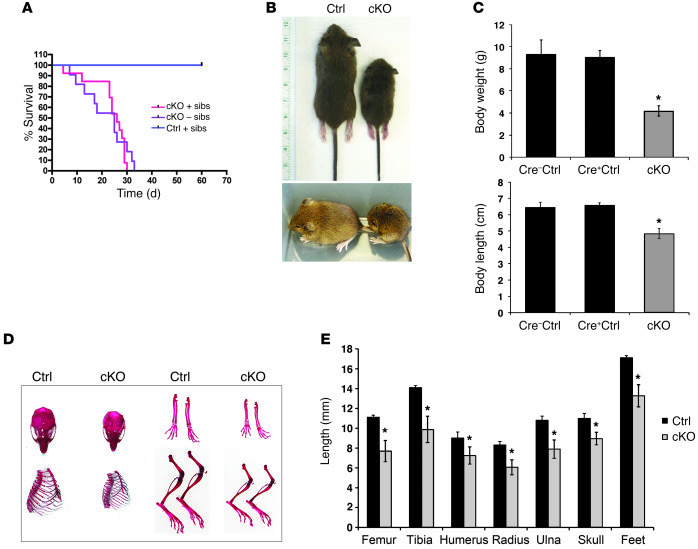 Expression of active forms of FOXO in tumor cells prevents tumor growth in vivo. Additionally, protein partners of FOXO, such as p53 and SMAD transcription factors, are tumor suppressors. Investigating the ensemble of FOXO protein partners will provide insight into the connection between aging and cancer. Can you live without FOXO? It depends if you are a worm, a fly, or a mammal. Worms lacking daf-16 or flies lacking dFOXO are viable but do not show an increase in lifespan following mutations in the insulin/PI3K/Akt pathway. FoxO1-null mice (mutants that have no FoxO1 gene) die at embryonic day 10.5 from defects in angiogenesis. FoxO3- and FoxO4-null mice have also been produced and are viable: FoxO3-null mice exhibit an age-dependent infertility in females, while FoxO4-null mice have no apparent phenotype. FoxO6-null mice are currently being generated. The four mammalian isoforms (different form of a protein) may have both distinct and overlapping functions, and compensation of one member by another may mask the function of individual FOXOs. Investigating the role of FOXO factors in longevity and tumor suppression will require more complex mouse models in which multiple FoxO genes are deleted. What remains to be explored? More FOXO target genes remain to be discovered, as do regulators of FOXO function. An exciting area of future exploration will be to determine how FOXO factors mediate cell non-autonomous processes in the entire organism. The recent discovery that FOXO can upregulate neuropeptides in the hypothalamus suggests that FOXO can regulate animal behavior, and future studies will elucidate how hormones and neuronal signaling cause FOXO- dependent transcription of target genes that affect the entire organism. Interesting research was performed by Dr. Natalie Berube’s group from Western University and Lawson Health Research Institute about the role of ATRX gene and its role in brain function and aging. The paper, published in the Journal of Clinical Investigation, tells us the story of premature aging in mice that lack ATRX gene. Apparently, if we completely switch off this gene, mice will have reduced growth, shortened life span, lordokyphosis, cataracts, heart enlargement, and hypoglycemia, as well as reduction of mineral bone density, trabecular bone content, and subcutaneous fat. These all are signs of premature aging. Researchers found that on molecular level animals with no ATRX gene develop severe damage of telomeres in their brains, specifically in the forebrain and anterior pituitary and reduced levels of thyroxine and IGF-1. Basically this means that ATRX gene is responsible for maintaining DNA integrity. Less DNA damage – better survival. The animals didn’t have ATRX gene in their brains only, therefore all of the detrimental effects were apparently due to effects of embryonic development. Hence, ATRX must be a crucial protector from DNA damage in proliferating cells. Here comes the important question – what happens to ATRX activity in humans during aging? Does it remain the same as it is in a young body? It would be interesting to investigate this, because if ATRX activity is lover in older people than in younger ones, then it means that this gene is securing our longevity, apparently by protecting us from DNA damage. In this case, it could be another target for longevity therapy.